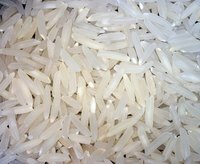 Jasmine rice, also called Thai fragrant rice, is a long-grained variety of Southeast Asian rice. Known for its non-sticky qualities when compared to other Thai rices, it has a nutty aroma and slightly sweet flavor. It is widely available in North American stores and has been a popular rice to serve with almost any meal. However, while it cannot fully replace other hard-to-find Asian sticky rices in certain meals, certain methods can be applied to its preparation to make it more sticky. Place the rice in the large bowl and rinse it four times with cold water, filling up the bowl, swirling the rice with your hand and then pouring out the water while keeping the rice in the bowl. Pour out any excess water in the bowl so it is all drained. Fill the bowl with cold water again so that it covers the rice by 3 inches. Soak the rice for eight hours, undisturbed, on a counter top. Drain the excess water from the rice, but do not rinse it. Place the rice in the rice steamer and cover it with 2 cups water. Set the lid on top and start the cooker. Cook the rice according to manufacturer's instructions. Drizzle the vinegar over top evenly and mix it in with the wooden spoon.